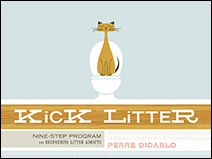 In honor of Earth Day 2010, the big guy we live with is doing a book giveaway at MODERN CAT. Meanwhile, for your entertainment, here's the latest Kick Litter wallpaper. Miss Litter designed this wallpaper. She must be pretty good at photoshop considering I don't play the piano.